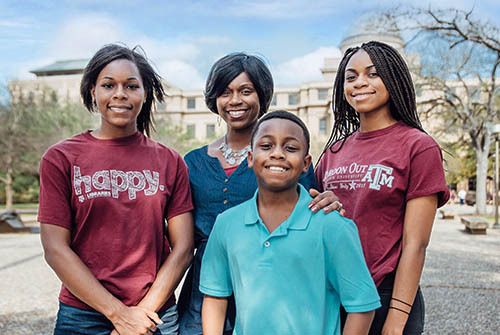 After receiving a scholarship that allowed her to pursue a degree at Texas A&M, Tiffany Wilmore ’98 establishes her own scholarship that will provide a future student with the same opportunity. Tiffany Wilmore '98 with her children. Twenty-two years ago, Tiffany Wilmore ’98 received a $25,000 academic scholarship that allowed her to attend Texas A&M University. She earned a degree in a subject she loved, received a diploma from her dream institution, and created a new life for her and her family as a first-generation college student. Fast-forward to today and another scholarship of $25,000 intends to do the same thing—provide one lucky student with the chance to attend Texas A&M. This time, the scholarship will come from Wilmore herself. She has named the Texas A&M Foundation as beneficiary of a life insurance policy with the hope that it will give another student just like her the same opportunity she received years ago. Wilmore hopes the scholarship will encourage more graduates to give back to their university and provide future students with opportunities like the one she received years ago. After graduating with a bachelor’s degree in business administration, Wilmore became deeply rooted in the Texas A&M alumni system. As a member of the Houston A&M Club and Compassionate Aggies Mentoring Program, Wilmore makes a difference in people’s lives and spreads the Aggie spirit to various communities in the Houston area. Wilmore, second from right, at Women, Wealth & Wisdom in 2016. 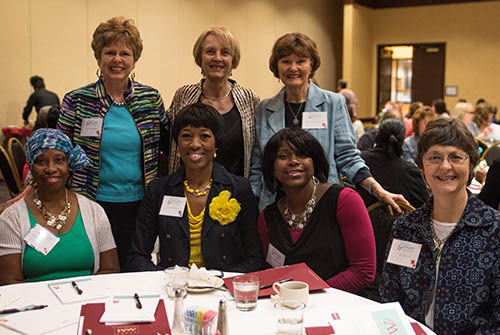 Along with her involvement in alumni organizations, Wilmore has attended the Texas A&M Foundation’s “Women, Wealth, and Wisdom Conference” for the past three years. The workshop, put on annually by the Foundation’s Office of Gift Planning, empowers women to take control of their finances and educate themselves on the topics of money, finances, investing, insurance and estate planning. For more information on this year's Women, Wealth & Wisdom on May 19, 2017, please visit www.txamfoundation.com/www.